Welcome to the Whispering Lion website! NEW YORK ATTITUDE is Whispering Lion's latest full CD, released Dec. 31, 2010, on the brink of the new year 2011. New York Attitude is available only online, and again totally free! This is new plus previously unreleased older "smoky" reggae material by the Whispering Lion in totally fresh mixing. You can listen to this new CD via the built-in mediaplayer, or download the tracks. Enjoy! 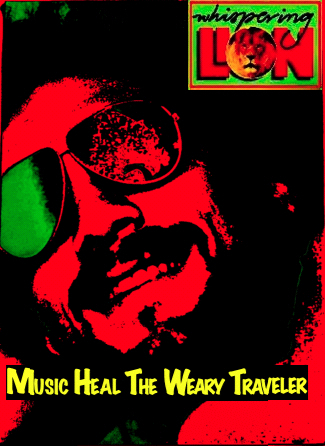 MUSIC HEAL THE WEARY TRAVELER is Whispering Lion's previous full CD, released Nov. 16, 2009, available only online, and totally free! It is a collection of original reggae songs recorded on a warm summer day, in August 2007, with Ralston Grant (Twinkle brothers), Demondo (Derrick Fevrier), Barry Prince, Dub Judah, and Aron Shamash. You can listen to this new CD via the built-in mediaplayer, or download the tracks. 4 more new albums will be released over the coming months! So come back regularly. Plus 4 brand new 2009 REMIXES of YOU AINT COOL and DON'T BLAME YOUR PAIN ON ME where added recently. Also enjoy all the previous Whispering Lion albums. Whispering Lion combines socially conscious lyrics with music that uplifts the soul and rekindles the spirit. With his distinctive, charismatic style, he is as different and enjoyable live, as on record. He is one of the few American reggae artists to have reached an international audience. Whispering Lion is a genuine original. Whispering Lion is R.A.W. member #990. 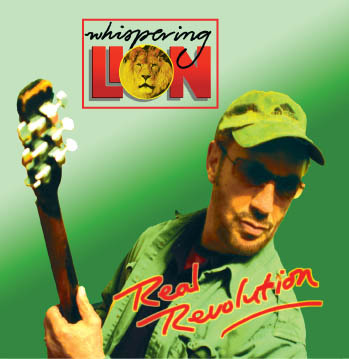 After years of hard work, to build himself a studio, and to master the arts of recording, producing, dubbing, etc., and of course creating the music and lyrics, in August 2005, the Whispering Lion finished his new, completely independently produced CD: REAL REVOLUTION. The new album was produced working with some very great artists, including members of the Twinkle Brothers. It is officially released in May 2006. The music is great, mellow and groovy, roots reggae with rock influences, while the texts are positive, uplifting, and actual as ever, with beautiful female background choirs. Besides influences from Bob Marley and Bob Dylan, hints of JJ Cale, Leonard Cohen, and early Burning Spear can also be heard. The album ends with some real great dub versions of some of the songs. Whispering Lion: "REAL REVOLUTION celebrates my 20th year of recording, releasing and performing Reggae music. Thanks to your support, my songs have reached an international audience." For photos and short bio's of all the "Real Revolution" musicians and technicians: Meet the Musicians. Samples of all tracks, as well as complete lyrics, and a free complete track can be found on our MP3 page. If you are a DJ of a reggae program/station, please contact us at wlion@sbcglobal.net for a promo-kit! Please include your website URL in the email, if possible. What is your favorite song from REAL REVOLUTION and Why do you like it? and the previous CD: TRIBUTE TO THE SPIRIT at CDBaby. Whispering LION's previous full album release on physical CD, TRIBUTE TO THE SPIRIT, released June 1998, was "Top Ten Record of 1998" in both Israel and Guam. One of the most popular tunes, "Up2Us", was selected to be on the "RAW 2000" compilation CD, which has tunes from 20 Reggae artists around the world. Click on the CD cover to listen to Hi-Q MP3 samples, incl. some full tracks and 2 SPECIAL 2001 REMIXES of this album or check reviews of the Tribute to the Spirit, such as this one from The Beat:"Whispering Lion puts a new slant on politics, love, rock, and reggae"
Whispering Lion first came to prominence in 1986 with his slamming debut single, "You Aint Cool/Don't Blame your Pain on Me". Dee Jays praised the 12" record as "one of the best Reggae records ever." Reggae Calendar said that the album featured the most imaginative use of female backing vocals heard in Reggae music." Four fresh 2009 remixes incl. 2 dubs, of this single have now been added to the MP3 samples and tracks page. This classic single can also still be ordered in the original form, from the Whispering Lion himself, for price and ordering info check the News page. In 1990, Whispering Lion released his second single, the classic dance club tune, "Love Posse". Soon after hitting the streets, the 12" record quickly became one of the top dance tracks of the year. The music (and video) made top ten charts on both the East and West coast. Check the review by Calendar Magazine: "...an urban sound that's prime for parties and late night loving...". From 1990-1997, Whispering Lion recorded and performed with a rocking band that included Hux Brown, from Toots and the Maytals, on guitar, Rankin Scroo on bass, Ginger on keyboards, and Ron Rhoades, from the Shakers, on drums. Whispering Lion currently lives in Castro Valley, California where he just finished working on the new CD, and is full of plans for the future. Whispering Lion Music, World of Rhythm, PO Box 4071, San Leandro, CA 94579, Ph: 510-346-5466/Ph: 510-346-LION FAX: 510-357-5763.